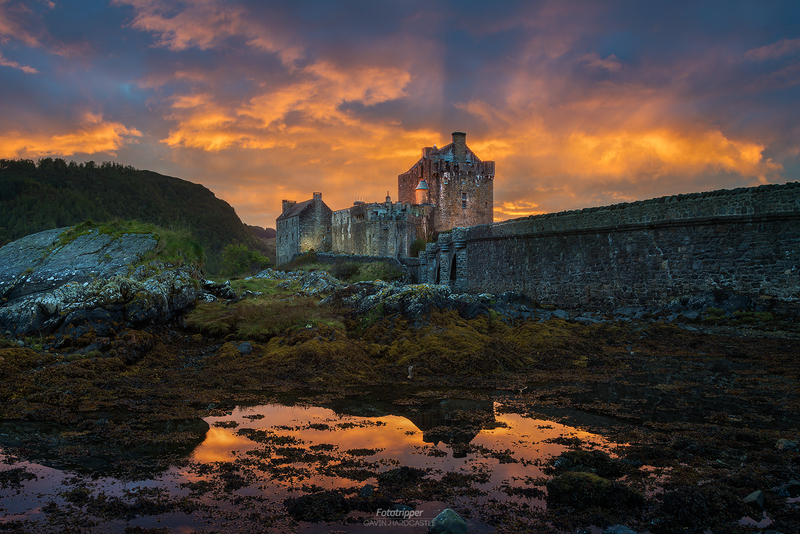 On the first day of my Scotland Photography Workshop we arrived at Eilean Donan Castle near Kyle of Localsh to this majestic light show. Pretty much every photographer in the nearby vicinity was in full photogasm mode just gawking at the best sunset I’ve seen in a couple of years. For an entire hour the light just got better and better. I can’t remember the last time that happened, but to happen during a workshop was more than I could have asked for. While shooting I was really hoping that the colour in the sky would stick around long enough that the lights of the castle would paint the walls with that nice warm glow. As always, my goal is to keep the ISO setting as low as possible to maintain a noise free image. I took two manual exposures to capture all of the dynamic range I needed. The first shot was exposed for the sky so I shot with a shutter speed of just 0.8″. My second shot needed a much longer shutter speed of 8″ in order to capture all of the detail in the shadow areas of the composition. I then performed manual exposure blending in Photoshop to put together an image that captured all of the dynamic range I was able to see with the naked eye.